Probably few people have heard of the Gut Dam. It had a very minor supporting role in my doctoral dissertation on the history of the St. Lawrence Seaway and Power project, and is mostly reduced to footnotes peppered throughout my forthcoming book (I just finished the final copyedit and the book is slated for release around February 2014) on the same topic. So I decided that a quick synopsis of the Gut Dam story might make a nice little blog post. Canada installed the Gut Dam in the St. Lawrence River in the first decade of the twentieth century, with U.S. consent. It was placed between Galop and Adams Islands, just downstream from Prescott, Ontario and Ogdensburg, New York (see images). The main purpose of the dam was to eliminate a cross-current that interfered with vessel transit in the nearby Galop Rapids, as well as raise the water level in the upper entrance of the Galop Canal. The dam was a low barrier consisting of a stone-filled timber crib about 30 feet in width resting on the river bottom, topped with about two feet of concrete. A mixture of stone and clay was placed along the upstream side of the crib and a rock fill on the downstream side. The Gut Dam raised little controversy for the first half century of its existence. But in the early 1950, in the lead-up to the construction of the St. Lawrence Seaway and Power Project (built between 1954 and 1959 by Canada and the U.S.) engineers had to establish a “river profile” and develop a “method of regulation” for the river and Lake Ontario. 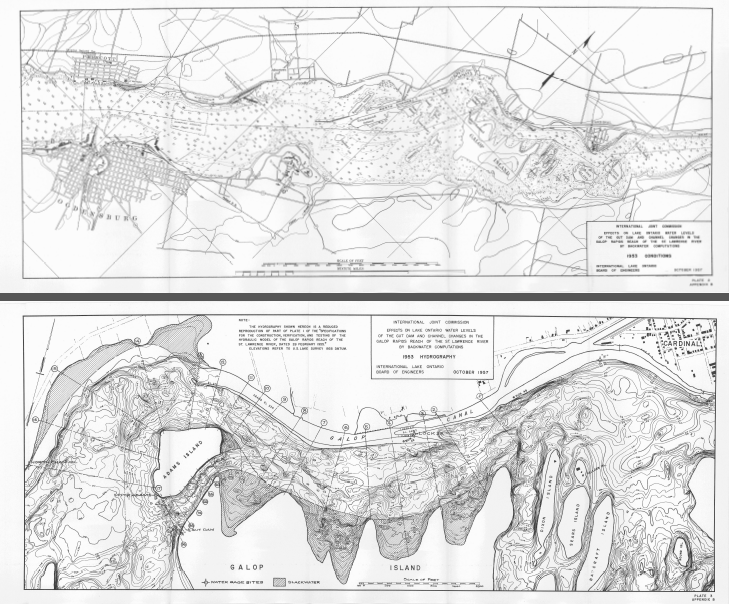 A “river profile” meant the side schematic view of a river’s course from start to finish – the damming of the St. Lawrence changed the profile from a series of incremental slopes to just a few large drops, more akin to stairs. The “method of regulation” referred to the levels between which the water would be maintained by dams and control works in order to meet prescribed goals (e.g., hydroelectric production). I’ve discussed the engineering and regulating of the St. Lawrence in other blog posts, and do so in great detail in the upcoming book. Suffice it to say here that the overarching aim was to maintain the water levels at an average that equated to “natural levels” but also to improve on nature by removing the extremes of high and low flows in order to create a predictable and orderly river. “Natural” was defined as that which had existed in the nineteenth century before the first man-made alterations to water levels – that is, before the Gut Dam was installed. Yet, establishing exactly what constituted a “state of nature” was problematic from the outset for a number of reasons, including the fact that Canada and the U.S. disagreed on the historic impact of the Gut Dam on water levels. The chairman of the U.S. section of the International Joint Commission, which oversaw the engineering of the river, nonetheless stated that the St. Lawrence project would be approved “over his dead body” if the Gut Dam was not removed first, since shoreowners on the U.S. side of Lake Ontario blamed the dam for high water levels that damaged their property. It was clear that the Canadian government would need to consent to the removal of the Gut Dam in order for the dual St. Lawrence project to proceed. Thus Canada agreed to the dam’s removal, provided it would not prejudice navigation, power, and other interests downstream. Work to eliminate the dam began in October 1952, and in January 1953, the Canadian Minister of Transport announced that the removal of the Gut Dam had been completed. However, studies in the 1950s showed that Gut Dam’s impact on water levels in the river and lake had been exaggerated – it was really about four and a half inches, which was approximately half of what had been alleged by its critics. Nonetheless, a number of claims were subsequently made by U.S. Lake Ontario shore owners because of Gut Dam. They unsuccessfully tried to sue Canada, and requested that the U.S. Foreign Claims Settlement Commission examine the claims. Finally, in 1968, Canada agreed to pay a token $350,000 as settlement for the alleged damage. Aside from illuminating a historical tidbit that might only be of interest to those from the area, or those interested in dams and hydraulic engineering history, what do we learn from Gut Dam? The saga sheds a bit of light on the hybridity of certain riverine environments, evolving expert comprehension of Great Lakes water levels, and how science and engineering can be politicized. Finally, Gut Dam shows how all these issues flow into bigger issues (i.e., St. Lawrence Seaway and Power Project) in the history of North American transborder environmental/water relations. International Joint Commission, Canadian Section, docket 67-2-5:6, Lake Ontario Levels Reference, Meetings, McNaughton, Burbridge, Cote 1953/01/16, Memorandum to General McNaughton re: August 29, 1952, meeting, September 2, 1952. Carl F. Goodman, “Canada-United States Settlement of Gut Dam Claims: Report of the Agent of the United States before the Lake Ontario Claims Tribunal,” International Legal Materials 8, 1 (January 1969): 118-43.